Community street art projects aren't new around Detroit, though one launched this week stands out from the pack because serious dollars are attached. 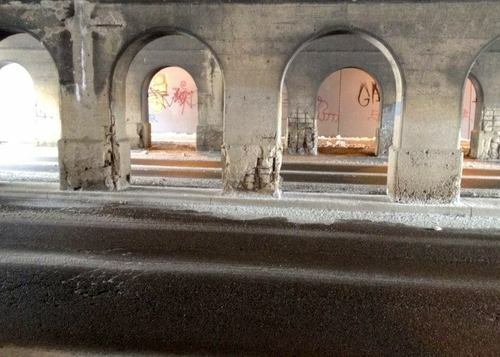 Two groups invite proposals to decorate a pair of Midtown rail viaducts with lighting and murals or sculptures. The winner or winners will get up to $75,000 per site to cover materials and a design fee. 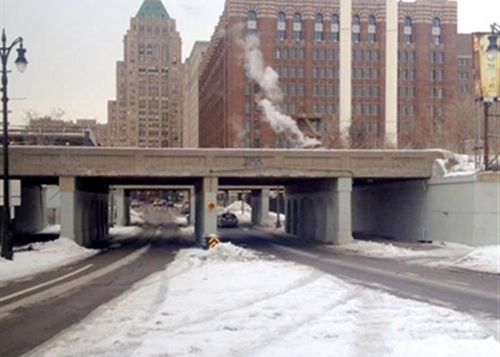 The sites are 1934 train overpasses on Cass Avenue and Second Avenue between Baltimore and Amsterdam Streets. The goal is "to give these industrial bridges new life, making them a choice destination," says a call for proposals from Midtown Detroit, Inc. It's sponsoring the project with another community development group, the New Economy Initiative. There's a new website and an April 30 application deadline. "Winning proposals will be selected by a panel of Detroit-based curators and arts professionals," says a seven-page Request for Proposals. Selections will be made in mid-May, announced May 19 and installed by September. Applicants may provide proposals for either one or both viaducts. If applying for both viaducts, proposals may treat each viaduct as two separate installations or visually connect the two viaducts with a cohesive design. . . . This call is open to all professional artists, architects, designers, design firms and/or teams consisting of these entities located in the following eight southeast Michigan counties: Genesee, Lapeer, Livingston, Macomb, Oakland, St. Clair, Washtenaw and Wayne. National and international partners may be included in any given team as long as the project lead can prove residency or physical presence in one of the . . . eight counties. More information and an online application is here. The New Economy Initiative was created in 2007 by 10 foundations to “return Detroit to its position as a global economic leader.” Midtown Detroit, Inc., an expansion of what originally was called the University Cultural Center Association, is a community development coalition with more than 150 members. Read more: Midtown Detroit, Inc.